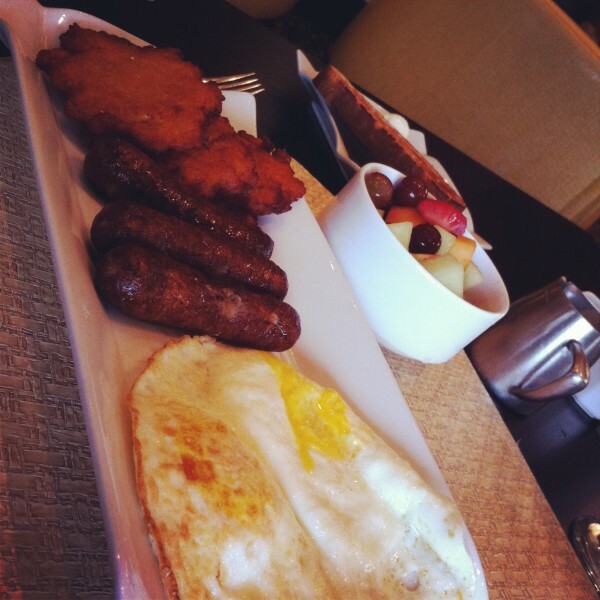 Our first (and only) full day in Nashville started out with a really nice breakfast at Prime 108. Lucky for us, Brad is a Marriott gold member so we received vouchers for $13 each for breakfast. There’s a trade-off when your husband travels a lot. 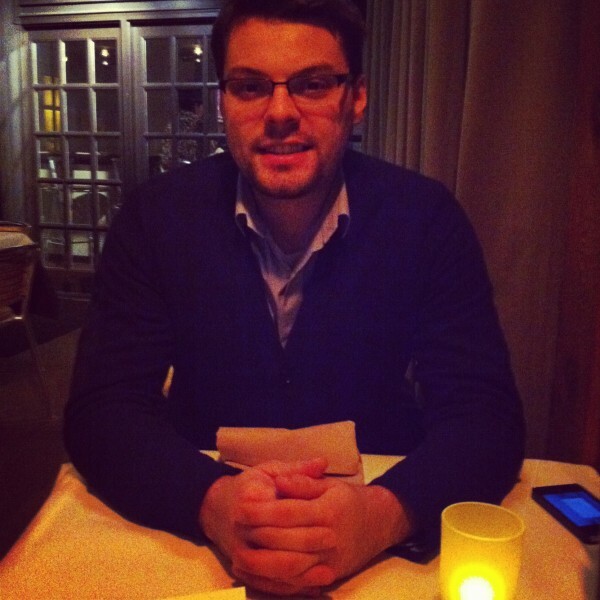 You miss him terribly a few nights every week, but you get to stay in nice hotels and travel on airline miles. I’m not sure if it’s an equal trade-off, but it’s nice to take advantage of it when we can. 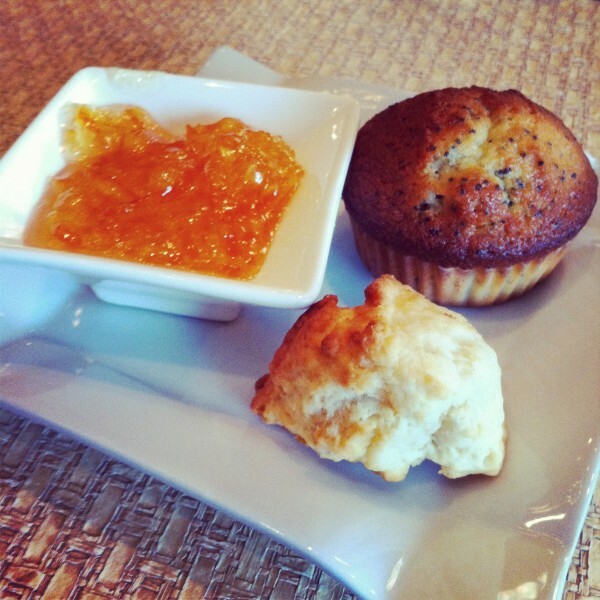 As soon as we were seated, our waiter bought us both a tiny little scone, a mini poppy seed muffin, and orange marmalade. I always forget how much I love orange marmelade. For my breakfast, I ordered two eggs over medium, chicken sausage, sweet potato cakes, and a side of fruit (hold the pineapple). I also had about 19 cups of coffee. It was a late night and totally necessary. Brad ordered the crab cakes Benedict with sweet potato cakes. The sweet potato cakes were so delicious, crispy and sweet. I’m pretty sure they were fried and would love to create my own healthier version. 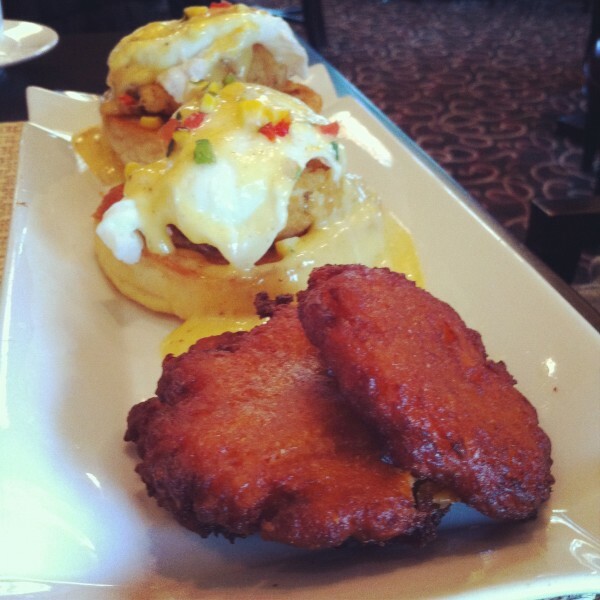 Breakfast could be summed up in two words: very yummy. The portion sizes were way too much for one person and I wished I could ask for a doggie bag to take my leftovers back to my room. I hate to see food go to waste, but not enough to finish my plate when I’m full. After breakfast, I set out to find a drugstore. Random fact about me: I always need to visit a drugstore when we’re on vacation. Another random fact about me: I believe in hairspray. I use hairspray everyday. It’s necessary. My hair can’t function without it. It took me FOREVER to find a drug store. If you ever travel to Nashville and are searching for a drug store in the downtown area, ask your concierge or a local for directions. Google maps is wrong. Did I mention that it felt like it was 11 degrees with the wind chill? After my hour-long drug store expedition (to buy a toothbrush, clear nail polish, sunscreen, and hairspray), I coaxed Brad into walking to the Gulch area to do a bit of shopping. I absolutely love checking out the local boutiques in new towns and and there’s not much that can sway me, even frigid temperature. 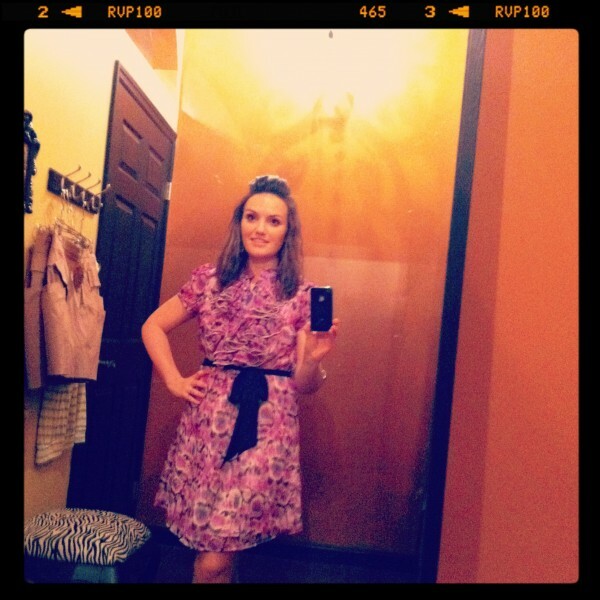 We found this awesome boutique called Apricot Lane. I bought THREE dresses! And tried on six. They were all great finds at 50-60% off. This one can be easily worn this winter with a cardigan and tights, but the other two are very summery. It’s painful to wait to wear new clothes, but I’ll definitely get plenty of wear out of them when the weather turns warmer. We visited several other boutiques in the area including Urban Outfitters and Two Old Hippies, which had the cutest baby clothes. Brad stopped me from buying our non-existant babies Beatles and Aerosmith t-shirts. A little premature I guess. We went back to the hotel so Brad could nap and I went down to the lobby to blog. We spent a few hours being lazy, then headed down to the hotel bar for a pre-dinner drink. I spent the next hour sipping Spanish red wine and texting my mom and my best friend about Whitney Houston’s death. I’ve always been such a huge fan since I was a little girl and find the whole thing so incredibly sad. It’s actually been quite a surprise to me how saddened I’ve been by this. What a talent. What a loss. 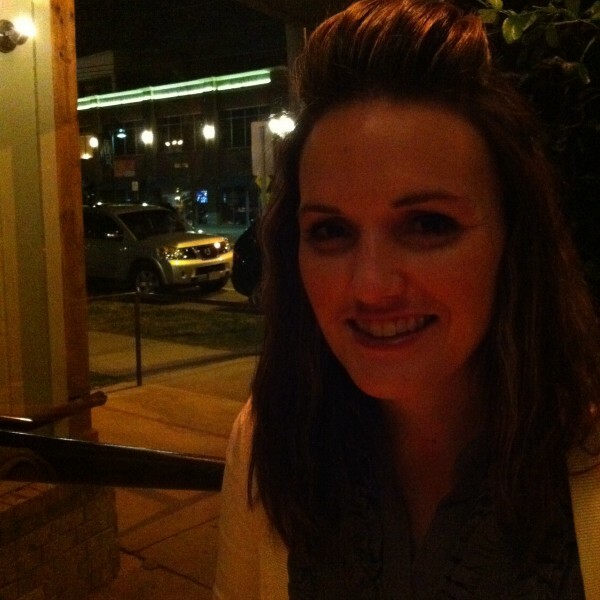 After a drink, we hopped in a cab for a short ride to the Belmont neighborhood to go to dinner. 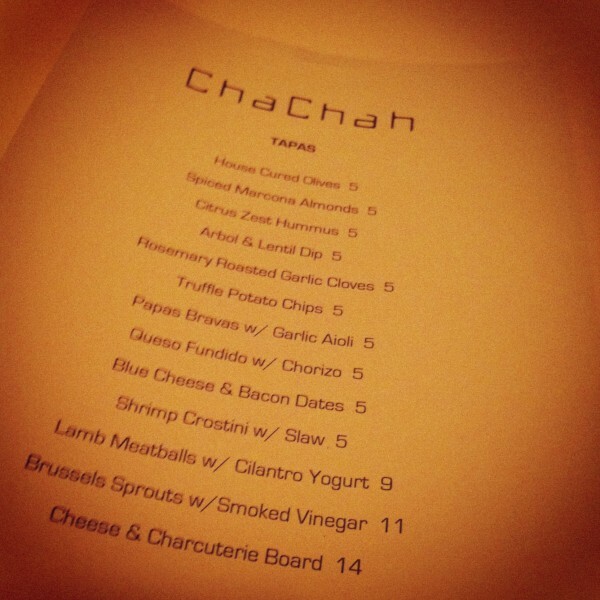 I made us reservations the day before at Cha Chah, a tapas restaurant I found after a bit of research. 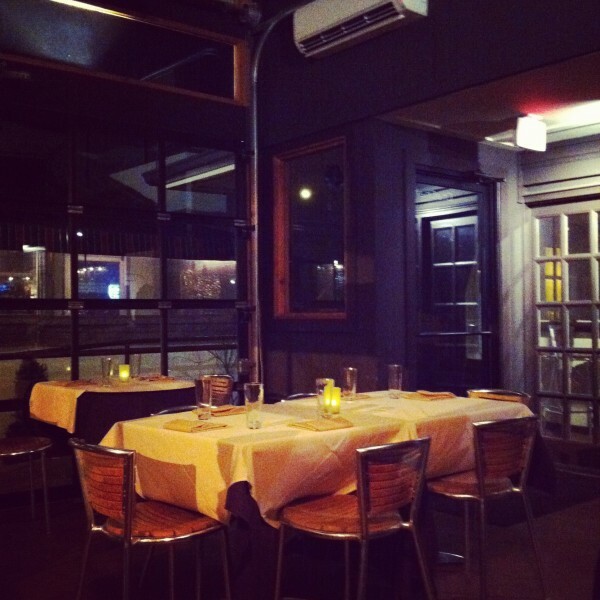 The restaurant is an old garage, turned into a minimalist, trendy restaurant. 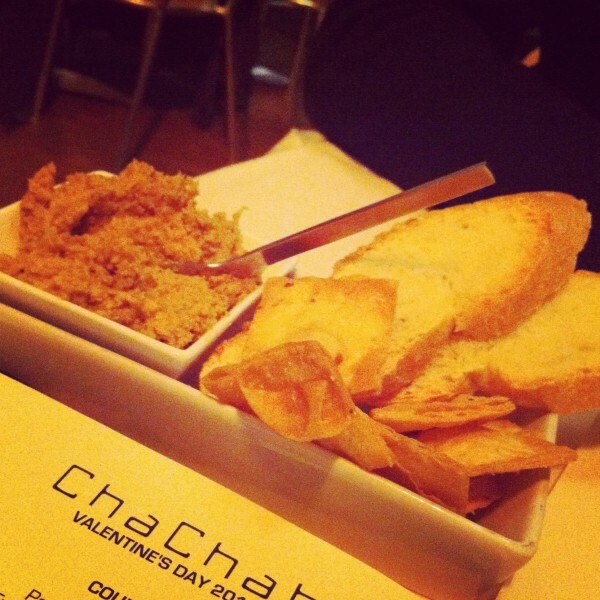 We started off with spicy hummus, bread, and pieces of fried wonton. 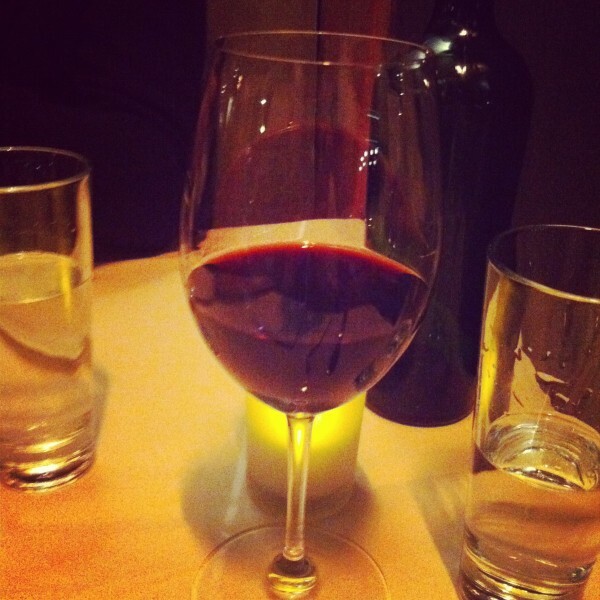 I chose a glass of Malbec to sip over dinner. 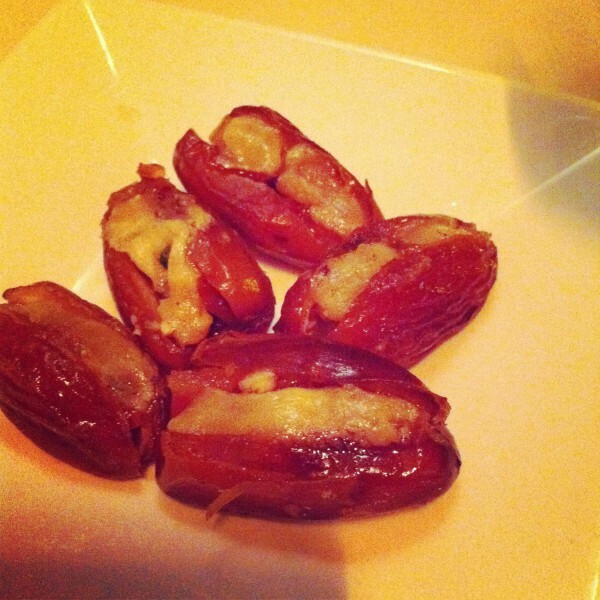 Our second dish was hot dates with blue cheese and bacon. They were incredibly tasty, but how could you go wrong with that combination of ingredients? 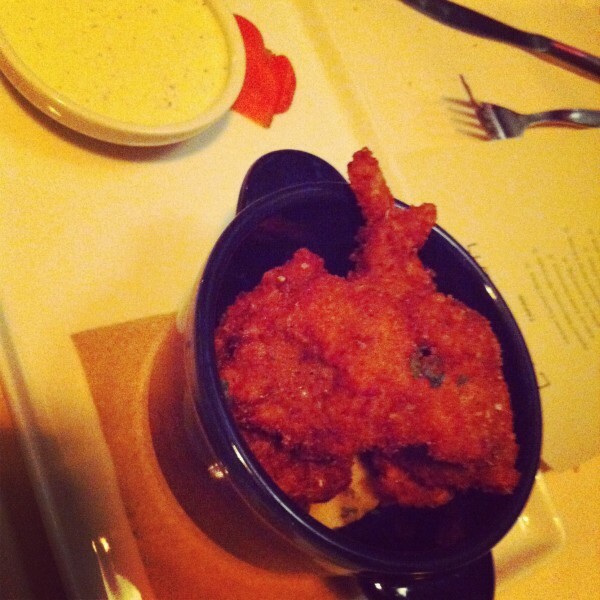 Next, we shared the “Hot Chicken”, which was actually Tabasco brined quail with ranch dipping sauce. Then we split venison with fava beans. 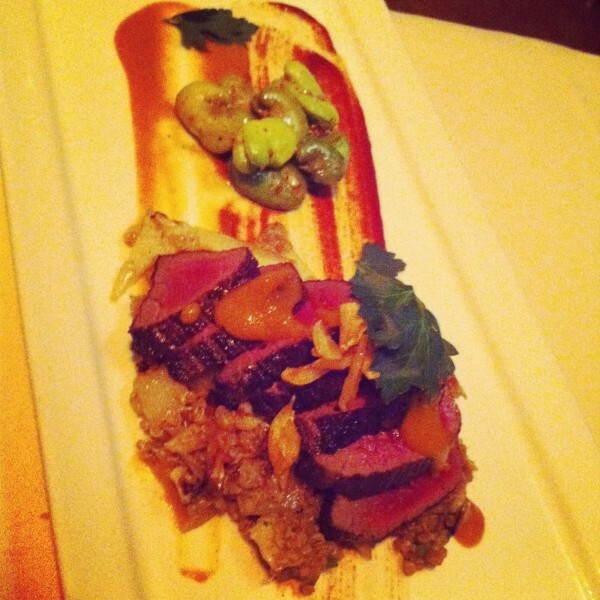 I’ve never eaten venison in a restaurant, and Cha Chah definitely go this dish right. The venison was cooked perfectly. 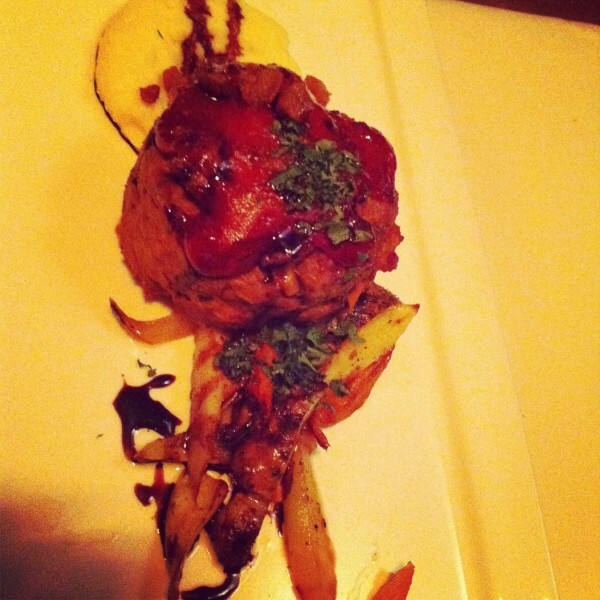 Brad’s favorite was the duck meatloaf and I have to say that it was pretty incredible. 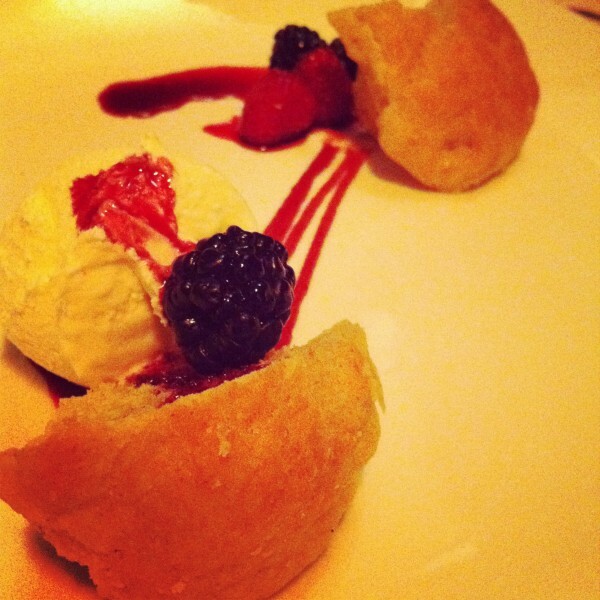 Our last dish was the cinnamon brioche with cream cheese ice cream. This dessert was the perfect size — just a few incredible bites to round out an incredible meal. After dinner, we cabbed it back to the main strip to check out some bands. 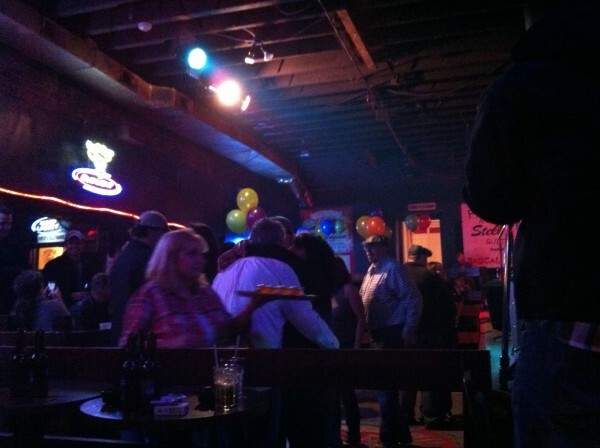 We headed back to Whisky Bent Saloon, like the night before, but found it to be super crowded. Brad suggested we head to the second-floor loft, but when we got to the stairs that led to the loft, we stopped short when we noticed “VIP Area” written across the doors. …well, as best as Brad and I can manage. 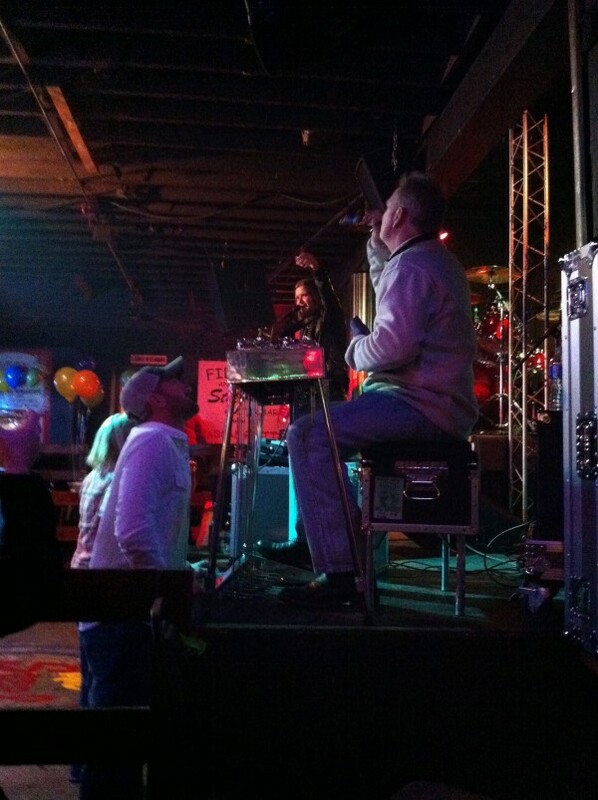 By the end of the night, the owner was hugging me and telling me to come back any time we are in Nashville. Moral of the story: when in doubt, just act like you’re in the right place. 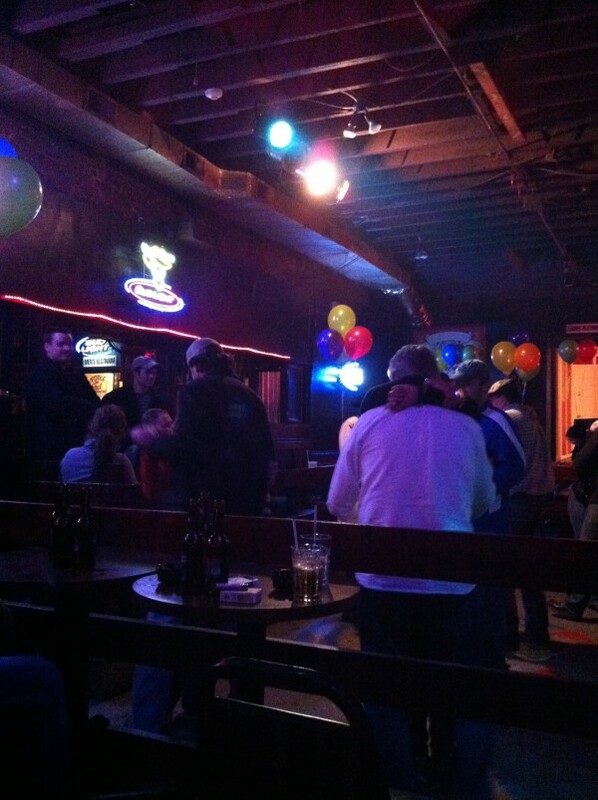 We decided to go into a very busy bar where a band was playing county cover songs. This bar had a dance floor and every time the band played a slow song several couples would get out on the floor to dance. The steel guitar player was hilarious and leaned down several times to talk to us and make fun of me for yawning or for drinking water. Brad and I danced a few times as well. I was exhausted after staying out late the night before, but managed to make it to a little after 1 am before asking if we could go back to the hotel. Overall, I had a blast in Nashville. The hotel was really nice, the food was fantastic, the entertainment was so much fun. I bought my non-existent baby a UCLA onesie that was 1/2 off at Target last month. I also have a Pinterest board devoted to the future kiddos. My husband doesn’t know about either; they just don’t get it! I don’t know why I can’t buy gender neutral baby clothes either! I am a large fan of your words to live by- I live by them too! And look what kinds of rewards ya’ll got for it! 😉 Looks like Nashville was a blast! I also agree. Wouldnt’t change a thing. Also, it is great to get to travel with my best friend! I know what you mean…we were able to go on a super nice honeymoon because of some of his travel perks, but it would be so nice for him to be home every night of the week. Yes…travel benefits are standard with us too. I love free stuff and upgrades, so I’m not complaining. Give me a chain hotel and at least I know what to expect. 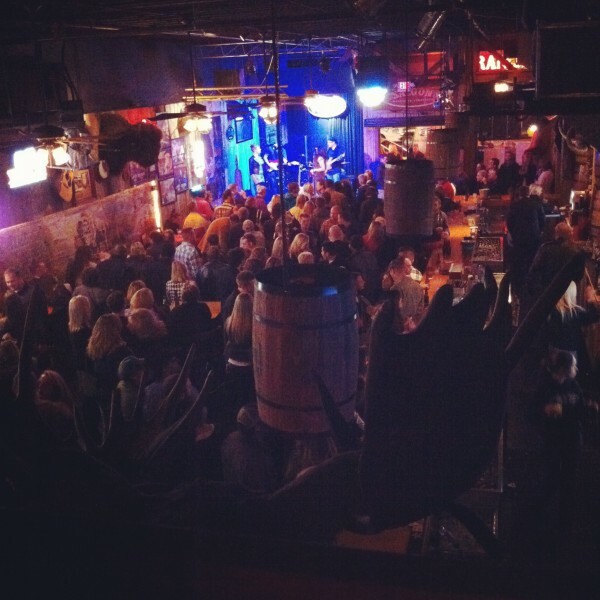 I have only been to Chattanooga, but Nashville looks awesome. We always roll with chain hotels unless we know it’s a really nice hotel. I’m totally spoiled. I’ve never been to Chattanooga. For TN to be so close, I really haven’t seen much beyond eastern TN. Haaaaaa i LOVE that y’all sauntered into the VIP area and became BFFs with the bar-owner. That’s so the way to do it!! Let me know when you’re up for a run-date (well, once this freezing spell passes…eek! I can’t make myself get out there when it’s this cold!). Yes! I’m up for a run pretty much any day after 5 and I’ll be in town the last two weekends in Feb. Just let me know! So glad y’all had such a fun trip! Everything you ate looked wonderful! My husband went to Vanderbilt and I used to love driving down there to visit. It’s such a fun city with so much going on!